Mission Statement: To fulfill President Lincoln's promise "To care for him who shall have borne the battle, and for his widow, and his orphan" by serving and honoring the men and women who are America's veterans. The Department of Veterans Affairs (VA) Core Values and Characteristics apply across the entire VA organization. These core organizational values are the foundation of VA culture and support VA's mission to provide the best care and services to Veterans, their families, and beneficiaries. 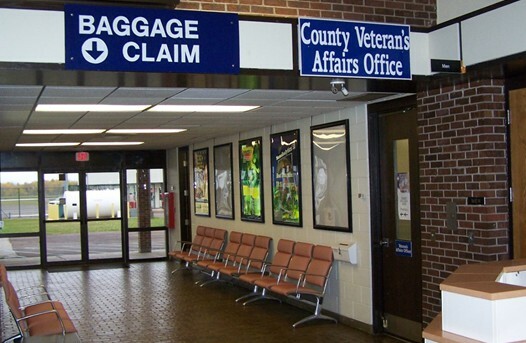 The Houghton/Keweenaw County Department of Veterans Affairs office is located in the main terminal of the airport, adjacent to "Baggage Claim" to help serve those who have protected our freedom past, present, and future. Walk-ins welcome, but appointments recommended to reduce wait times. To schedule an appointment, or DAV Van Ride, call (906) 482-0102.